a hell LOVE a town: Truth or Urban Dare? Last fall, as I mentioned here, Emily and I *dominated* the Hoboken Amazing Race. This year, we took it to the big leagues and signed up for a similar scavenger-type race in the Big Apple, Urban Dare. This time, we did *not* dominate, as there were 250 teams and a lot more area to cover. We actually didn't even get close. We have a feeling that the team that ended up winning either cheated or knew the bus system really well. Unfortunately, the only bus I am good at is the one that stops directly in front of my building, so Emily and I walked/ran a little too far between most of the clues. Feeling pretty dang popular when 735 (estimated) people all day were asking us "What *is* the Urban Dare?!" While waiting for the F train, talking to another team who was going to Union Square instead of Central Park where we were starting, getting on the subway and hearing the conductor say the train was going straight to 34th Street, noticing that the other team didn't hear, giggling to ourselves that they would have to go back downtown on another train. Making enemies with the pink tutu girls who wouldn't even say "hi" to us when we kept running into them, having them pass us in the three-legged race, commenting that they must have a looser tie than we do so it was easier for them, watching their tie come undone and them struggle to get it back on, passing them and saying "slow and steady wins the race". Waiting outside the big screen in Times Square to see our faces on it only to learn after ten minutes that American Eagle has commandeered the big screen and you have to go in to their store and buy something and wait in line to take a picture for the screen. Buying a $7 lip balm that I thought would be $2 (it's actually pretty good, so I can't complain too much). Being on a billboard in Times Square with my name spelled "Erein" and "No Comment" written next to us - funny how I freak out about typos, but on a billboard in Times Square, I see I misspell my name and I claim I have no time to change it since we are running against the clock! Can I use this on my modeling resume?!?! Get your picture in front of the restaurant where Paul Castellano was gunned down. He came up with the design for Beijing's Bird's Nest Olympic Stadium. Now he lingers in jail while his installation Circle of Animals is on display here in NY. Get your picture pointing to the animal you would be if you were born in 1893. 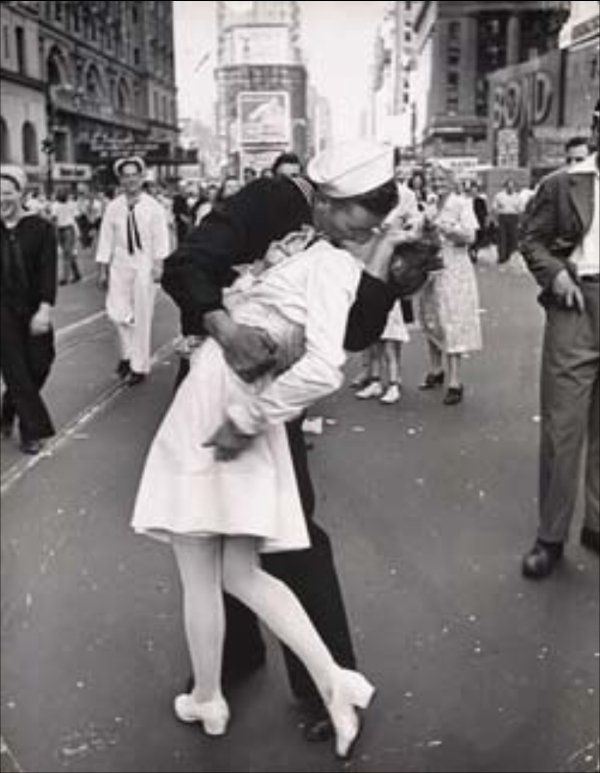 Get a picture of two people reenacting the famous WWII photo by Alfred Eisenstadt. --- We didn't even look at the original photo before taking this and look how freaking cute it is!